Forest Green came from behind at a blustery New Lawn to inflict a third successive defeat on Dover Athletic. The visitors went ahead when Nick Deverdics drove home after Stefan Payne tapped a free-kick to him. James Jennings levelled by turning in a corner and Darren Carter cut in soon after to fire Forest Green in front. The third came when Andy Rafferty failed to keep out Elliott Frear's wind-assisted corner and both sides hit the woodwork in a frantic finish. 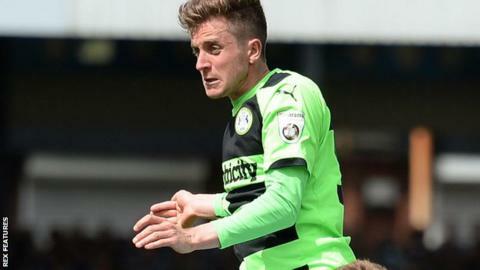 The victory kept Forest Green just one point behind Cheltenham at the top of the table, while Dover slipped three places to sixth. "We managed the first half very well. We knew what the conditions were going to be like in the second half because we'd checked the weather forecast. "Collectively, as a group it's been an absolutely fantastic week for this football club. "We've come a long way today and the conditions were terrible. "It's about attitude, we've shown we can do both. We can play football and work hard and roll up our sleeves." Match ends, Forest Green Rovers 3, Dover Athletic 1. Second Half ends, Forest Green Rovers 3, Dover Athletic 1. Aaron O'Connor (Forest Green Rovers) wins a free kick. Aswad Thomas (Dover Athletic) hits the bar with a right footed shot from the left side of the six yard box. Attempt missed. Jon Parkin (Forest Green Rovers) right footed shot from the centre of the box misses to the left. Kurtis Guthrie (Forest Green Rovers) hits the bar with a right footed shot from outside the box. Attempt missed. Sam Wedgbury (Forest Green Rovers) right footed shot from the centre of the box is too high. Substitution, Forest Green Rovers. David Pipe replaces Rob Sinclair. Goal! Forest Green Rovers 3, Dover Athletic 1. Elliott Frear (Forest Green Rovers) left footed shot from the centre of the box to the top left corner. Assisted by Elliott Frear. Attempt missed. Jon Parkin (Forest Green Rovers) right footed shot from the right side of the box is too high. Darren Jones (Forest Green Rovers) is shown the yellow card for a bad foul. Foul by Darren Jones (Forest Green Rovers).